The Chinese media offers a mixed take, while China’s leaders see an opportunity. In the midst of a domestic crisis, it is easy to forget that the rest of the world is watching. Now that the U.S. federal government has shut down for the first time since the mid 1990s, the talk of the town is the political problems of the world’s largest economy and sole superpower. In China, most media reports about the shutdown have been merely informative, but every now and then they offer a rare insight into what the Chinese have learned about America’s shortcomings. The notion of a government shutdown is strange for the average Chinese person because its consequences in the People’s Republic would go far beyond closed federal agencies and parks. In mainland China, and increasingly Hong Kong, every school and every agency (national and local) answers to a party minder. Banking and internet traffic are also closely monitored by Beijing. Should the party overseers be absent one day, many organizations crucial to China’s social structure would suddenly find themselves without official guidance. The effects of such an abrupt and unfamiliar decentralization are impossible to predict. Yet other commentators find the federal shutdown inspiring. Dr. Li Xiaohui, Assistant Professor of Law at Xiamen University writes, “The life of the average American has not been greatly affected by it and the economy has continued to grow. This reflects the clear limits between America’s government and the market. Our country should likewise move forward and decouple the government from the economy.” Similarly, the newspaper Nanfang Dushi Bao commended the strength of American society for being able to function without the government. Interestingly, while the American public sees the shutdown as a government failure, some Chinese are seeing it as a sign of efficiency. The common belief that the Chinese words for “opportunity” and “crisis” are the same, though wildly untrue, seems applicable in this case. While common Chinese citizens muse over the implications of a shutdown, China’s leadership has been giving the impression of merrily promenading through Southeast Asia, stealing the international spotlight. 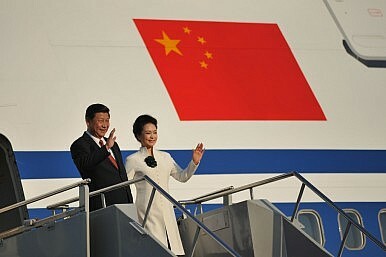 Taking advantage of Obama’s absence at the recent APEC and East Asia summits, President Xi Jinping visited Malaysia and Indonesia with a friendly demeanor that his predecessor would have likely avoided, greeting the Indonesian parliament in the local language and visibly travelling with his celebrity wife Peng Liyuan. In Brunei, on the other hand, Premier Li Keqiang stuck to the usual rhetoric of making progress on a code of conduct for the South China Sea disputes and indirectly urged the U.S. not to get involved. As the largest holder of U.S. debt, China unsurprisingly appears more concerned about American solvency than about the unfamiliar mechanics of a representative democracy. Despite this, China as a whole also appears to be learning a great deal from the shutdown, not only about the American political system, but also about itself and its future. As the shutdown enters its third week, it remains to be seen if America will learn something as well. Isaac Medina holds an MIR from Peking University. He has previously worked for The National Bureau of Asian Research and the American Foreign Policy Council.